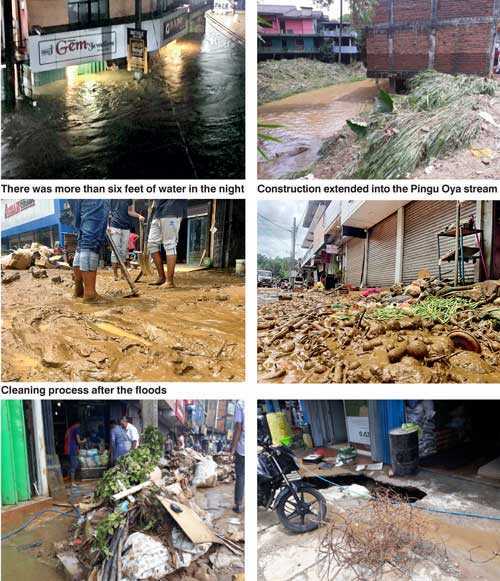 Continuous unauthorised construction along the Pinga Oya near the Kandy-Matale road has caused the flashflood, the worst in 20 years, with the level of water to rise to eight feet in Akurana and the cost of damage estimated to be around Rs. 250 million, government officials said yesterday. However, people from the area blamed the Government for not opening the sluice gate at the nearby Polgolla dam, built in 1972. More than 200 shops and 50 vehicles were hit by flashfloods with the water level rising within an hour in the small ethnic minority Muslim-dominated town of Akurana. Though the town of Akurana, with a population of nearly 75,000, has experienced repeated floods, the damage was minimum due to the time they had between the start of the rain and the rise of the water level, area residents said. “Within 30 minutes, the water level rose to five feet in my shop and eight feet in some other places,” said Salahudeen Mohamed Rumy, the owner of New Light Glas and Electricals in Akurana town, who said he had lost nearly Rs. 1.5 million worth of hardware goods. Floods mostly receded yesterday and people of the area were busy with cleaning the rubble and mud with the help of the Special Task Force amid heavy traffic since last morning. Heavy machineries were deployed to speed up the cleaning process. The businesses complained of the inability to sell their products submerged in the water. In the main town area, part of the pavement on the riverside has slipped into the earth. Many shops were also seen built within the river stream and above the river on some beams extending into the stream. 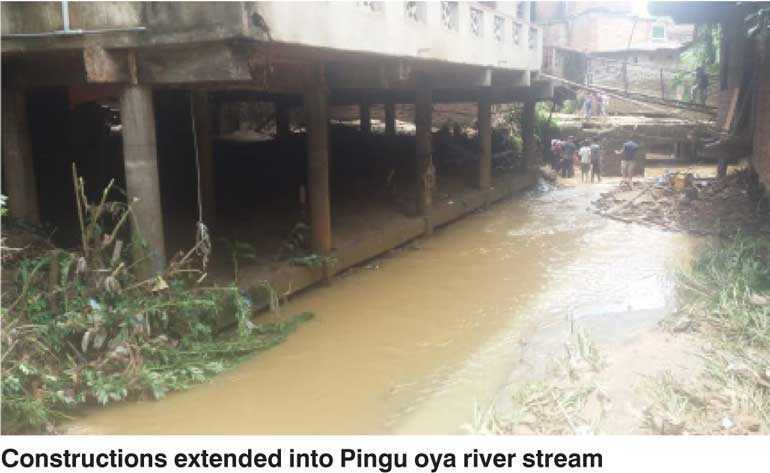 Some shops had extended their construction into the river stream and there were a number of small bridges built with a beam standing in the river stream, a clear violation of the standard process, officials said. “There is a lot of siltation in this river. Had the authorities opened the dam on time, the damage could have been much less,” said Ashkar Faisal, a business man and a local council member at the Akurana Pradeshiya Sabha. Most businessmen echoed the same blame, though officials argued otherwise. A study by researchers have said the narrowing of the river through construction into the river, stream corridors and flood plains are the reason for the frequent floods, an argument put forward by government officials. Akurana Divisional Secretary Madhawa Warnakulasuriya said they had repeatedly asked to remove unauthorised construction, which are built by blocking the river and have resulted in more siltation and have caused reduced infiltration. “According to my knowledge, around 18 unauthorised structures have been identified and have been recommended to be removed. But the local authorities have yet to remove them. We have also seen a raft of illegal construction of bridges across the river. Sometimes we reject a request to build bridges, but they build it within long weekends,” Warnakulasuriya said. Studies conducted by environmentalists have shown there was no possibility of a flood in Akurana as its elevation is at least 10 meters above the spillway. There had been no floods recorded despite the area receiving rainfall of more than 150 millimeters in 1990 and 1996. However, a little over 60 millimeters of rains had caused floods in 2006 and 2014 and floods have been recorded at least 14 times in the last 15 years through 2016 though there are no changes in the rainfall patterns, official data shows. Akurana Pradeshiya Sabha Chairman I.M. Isthihar said it was the worst floods in 20 years and floods have been frequent in the area, adding that the initial estimation of the total damage was around Rs. 250 million. “I think we have to take some tough decisions if we want to stop floods permanently. Studies have shown that unauthorised construction is one of the reasons. If the Disaster Management Ministry recommends removing some constructions, then we will have to do that for our overall benefit,” he said.